US Representative Alexandria Ocasio-Cortez, Democrat of New York, outside the Capitol in Washington, DC, Jan. 4. ‘Far left.” “Too liberal.” “Out of the mainstream.” Google US Senator Elizabeth Warren. You’ll see descriptions like these. “Socialist.” “Radical.” “Extreme.” Google US Representative Alexandria Ocasio-Cortez, the whirling, twirling, dancing phenom out of the Bronx. You’ll see words like those. But are even Ocasio-Cortez’s positions all that “fringe” in 2019? On “60 Minutes” Sunday, Ocasio-Cortez talked about a 70 percent tax rate for Americans earning more than $10 million a year. 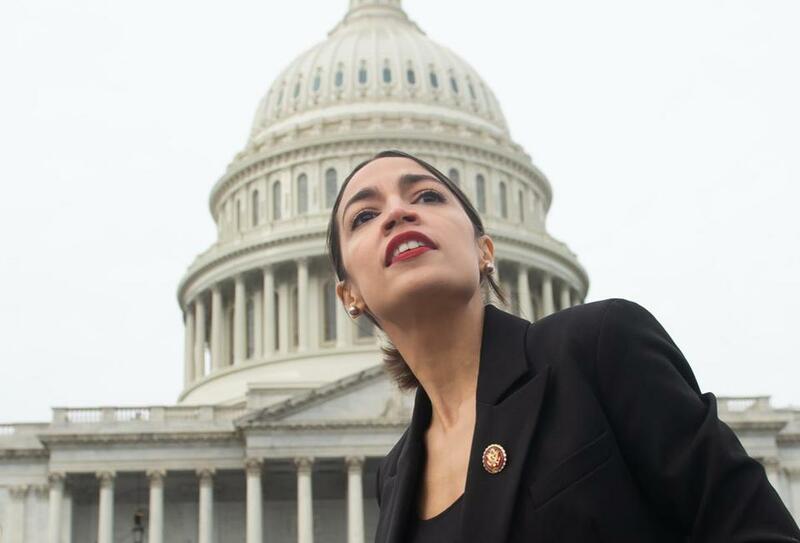 She said this would fund a Green New Deal: big money for renewable energy and technologies to avert climate catastrophe. That’s soak-the-rich, prosperity-killing insanity, conservatives claimed. And of who’s pulling a fast one: the billionaire campaign donors arguing for debunked trickle-down economics. Why? To keep more of their billions. But many forget that the top tax rate was more than 90 percent during the 1950s, and 70 percent for all income above $216,000, right up until Ronald Reagan became president, in 1981. He then declared government the enemy and slashed taxes for the rich. Thus ended the most successful period of middle-class economic growth in America’s history. Some of us actually remember those halcyon days. Dad’s salary alone was enough to support a middle-class family of four or five, to buy a modest home, get the kids most of the way through college, and still swing a vacation on the Cape in July. Hard to imagine now. But when the rich paid more, the government built highways and bridges. The MBTA parking garage wasn’t collapsing at Alewife station. The Red Line tracks weren’t catching on fire. No one talked about the 1 percent vs. the 99 percent, because income inequality was far less severe and it was hard to conceive of a single human amassing a net worth of, say, $88 billion (Warren Buffett, CEO of Berkshire Hathaway) or even $53 million (Robert Iger, CEO of Walt Disney). Right before Congress passed the Trump millionaire tax giveaway, Pew Research found that 43 percent of voters wanted taxes raised on Americans earning $250,000, nowhere close to $10 million. Sixty percent of Americans already suspected those millionaires weren’t paying their fair share. So why, asks New York magazine’s Eric Levitz, do we in the media call Republican Susan Collins of Maine, who voted for Trump’s tax scheme, a “moderate” instead of an pro-oligarch extremist? And why is Ocasio-Cortez, with her evidence-based tax proposal, derided as a know-nothing socialist kook? Meanwhile Warren says she’s a capitalist who wants capitalism reasonably regulated again. She wants to regulate Wall Street’s big banks. She wants to keep the Consumer Financial Protection Bureau, her brainchild, as a regulatory check against cheating mortgage lenders, credit companies, and student loan servicers. But the Trump administration, despite ever higher consumer complaints, has gutted its enforcement power. Aren’t we all supposed to oppose corporate cheats? She also wants Medicare for all and free public college tuition. So do 70 percent of Americans (85 percent of Democrats and 52 percent of Republicans). And 79 percent of Democrats and 41 percent of Republicans support free public college tuition. Most Americans also want coverage for preexisting conditions (75 percent), including majorities of Democrats, independents, and Republicans. Seems clear to me. Trump ran as a populist, but governs like Marie Antoinette. And a sleeping, scammed America is finally waking up. For Ocasio-Cortez, the sky’s the limit — but is she flying too close to the sun?